As parents, we all want to raise our kids to be the best they can be, but what’s the best way to go about doing that? Everyone has their own ideas on how to go about it – the plethora of books on the subject is evidence of that – but there are a few fundamentals that we can all agree on, and one of those is taking the time to interact with them, building social skills that will literally last a lifetime. 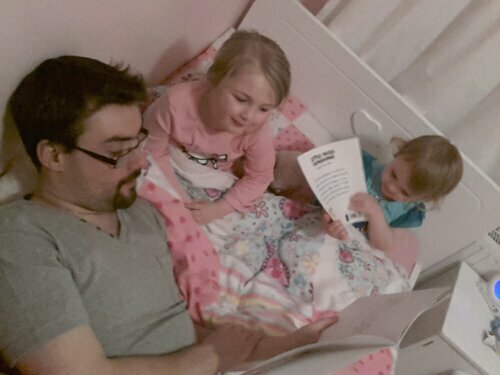 It’s no secret that I love reading to the girls, something I recently wrote about over at Mutterings of a Fool. But not everyone is as comfortable with their children, which is where the Scottish Government’s new campaign, PlayTalkRead, comes in. They’re looking to encourage all parents to interact with their kids, with a big part of that being the PlayTalkRead website which is chockablock with ideas of how to get involved with kids, with more being added all the time. PlayTalkRead are also running an ad campaign, which debuted during one of last week’s World Cup games, and asks us to #saythanks to the people who made us what we are today. I’d like to #saythanks to my own mum and dad, for the time they spent with me, the solid foundation that gave me, and the lifelong love of learning that came with it. I hope one day my own girls will be able to say the same thing. This entry was posted in Parenting and tagged playing, playtalkread, reading, talking by richy. Bookmark the permalink.